Fiction-Food Café: Winter Festival Noodle Soup from "Kung Fu Panda: Holiday"
Winter Festival Noodle Soup from "Kung Fu Panda: Holiday"
DreamWorks' "Kung Fu Panda: Holiday" Special–part of the "Kung Fu Panda" series which includes the two feature films, "Secrets of the Furious Five", and the "Legends of Awesomeness" TV series–is full of holiday cheer and noodle-y goodness. 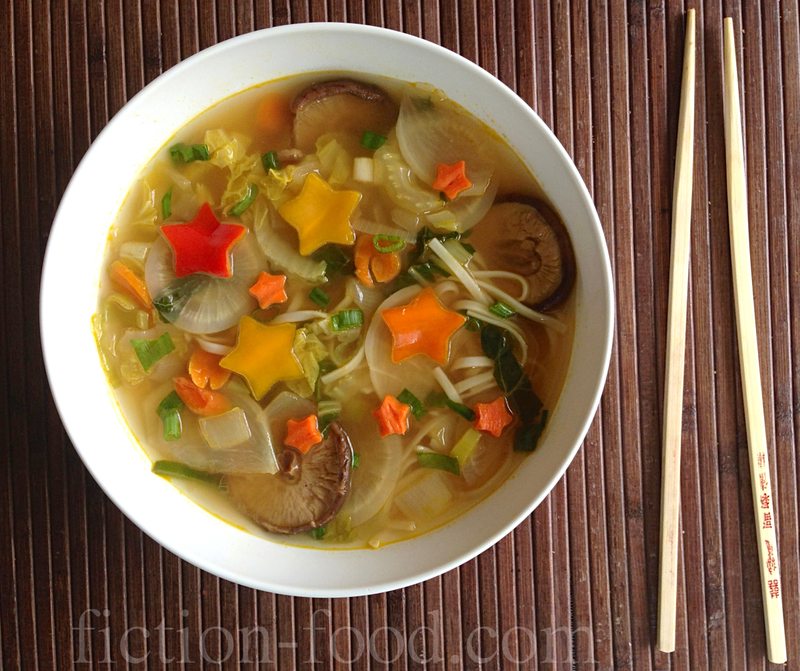 In the opening scenes, the main character, Po, is having "the noodle dream" in which he and his restauranteur father, Mr. Ping, are making the most amazing soup. 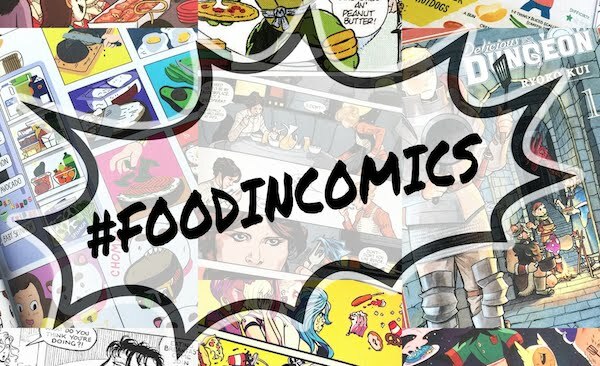 As they slice and dice and fly through the air they list off the ingredients and create a soup that shoots a customer into the sky from joy. Later in the episode–this time not in a dream–Po and Mr. Ping engage in an exciting and heartfelt father/son kitchen dance to create several bowls of delicious soup, complete with pretty garnishes, for their friends and families of the village. Po: There's always room for one more at Mr. Ping's. Shifu: Oh. No. I really don't want to disturb anyone. You go and enjoy your party. Po: I'm not going to enjoy it without you. 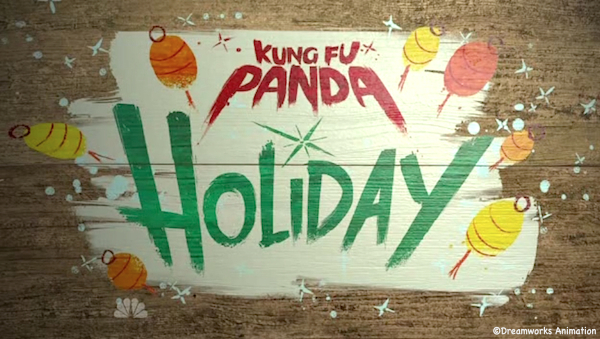 Shifu: Oh, no. I couldn't. These are your people. This is your family. 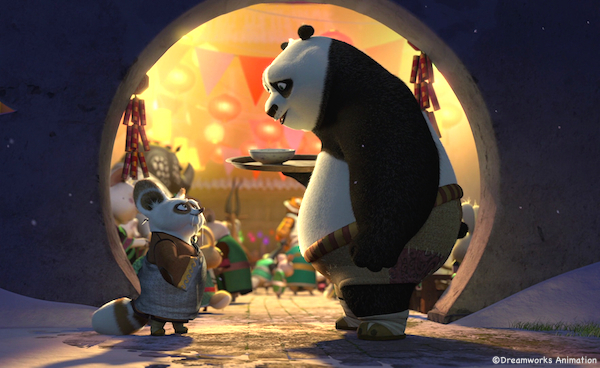 Po: You're my family too, Shifu. Now, c'mon. Shifu: That soup does smell good. Note: This soup is made with the ingredients Po and Mr. Ping list in the holiday special and does not include any meat (or beets). If you'd like to add chicken (breast or thigh), simply plop bite-sized pieces (about 1/2 cup worth or so) into the soup along with the carrots in step 3. And sorry, "no beets". 1. In a large pot on high heat bring about 4 cups of water, lightly salted, to a rolling boil. Toss in the chopped bok choy, daikon, turnips, & leeks & let boil for about 3 minutes. 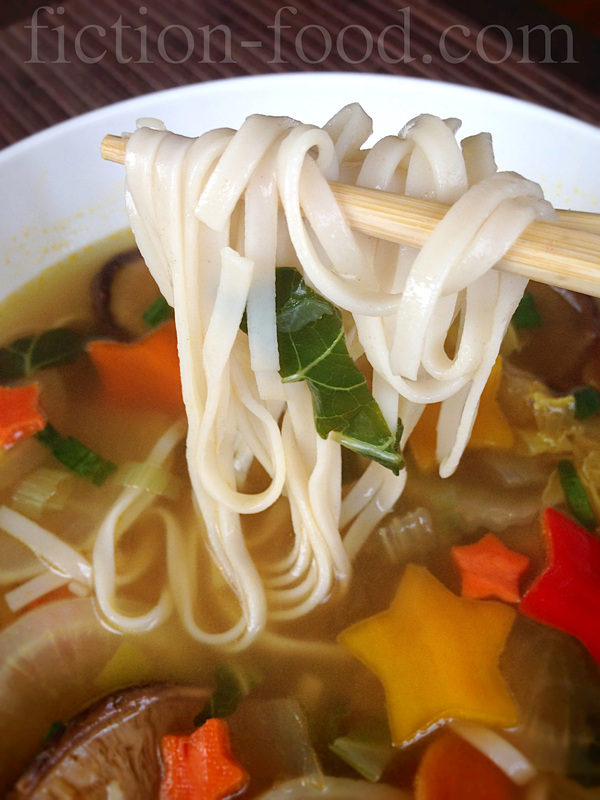 Remove from heat, drain, & set aside in a bowl until it's time to put them in the soup. 2. Put the dried mushrooms in a microwavable bowl & add the 1/2 cup of water. Heat in the microwave for 30 seconds, & then stir. Heat for 30 seconds more & stir again. Put aside for later. 3. In the same large pot, on medium heat, pour the sesame oil & sauté the garlic, ginger, & onions for about 2 minutes. Add in the red pepper flakes & soy sauce & stir. 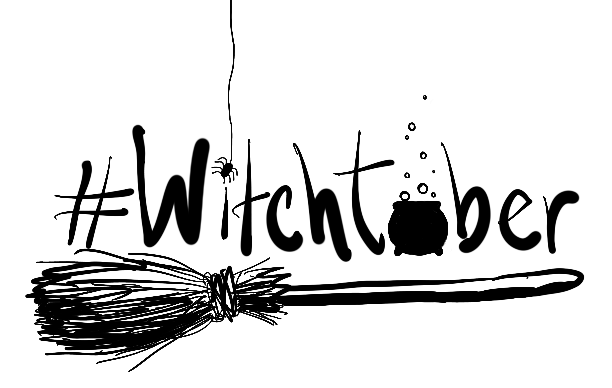 Next, pour in the vegetable broth & 3 cups of water & bring to a boil. Add the carrots & simmer for about 5 minutes. Next, add in the napa cabbage, salt, mushrooms (along with any juice), & the bok choy, daikon, turnips, & leeks. Simmer for 5 minutes more. Remove from heat & stir in the lemon juice. 4. In another large pot, bring 4 cups of lightly salted water to a boil & add in the lo mein noodles. Cook for about 8-9 minutes or until soft. Drain & toss under cold water. 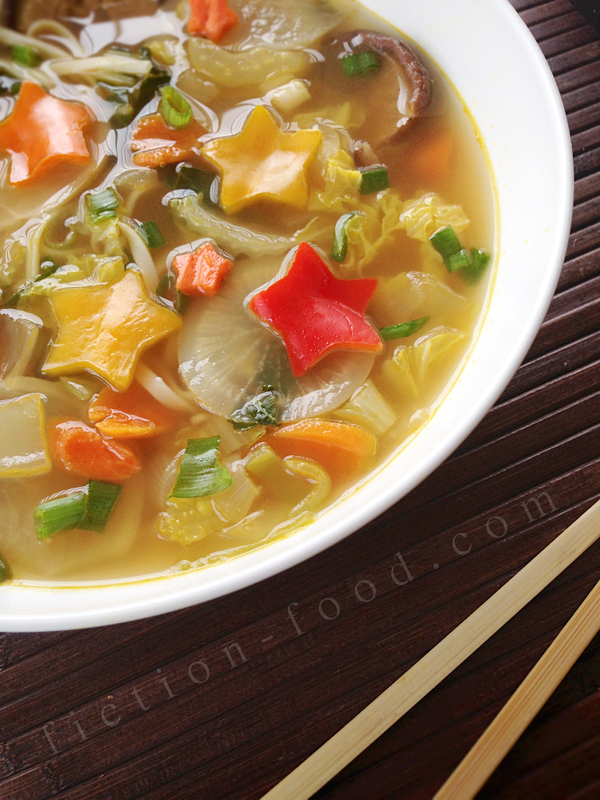 Place a medium mound of noodles in the center of a large soup bowl & ladle on soup & sprinkle on some chopped green onions. Cut stars from the sweet peppers (I also cut some teeny carrot stars) & arrange them on top. 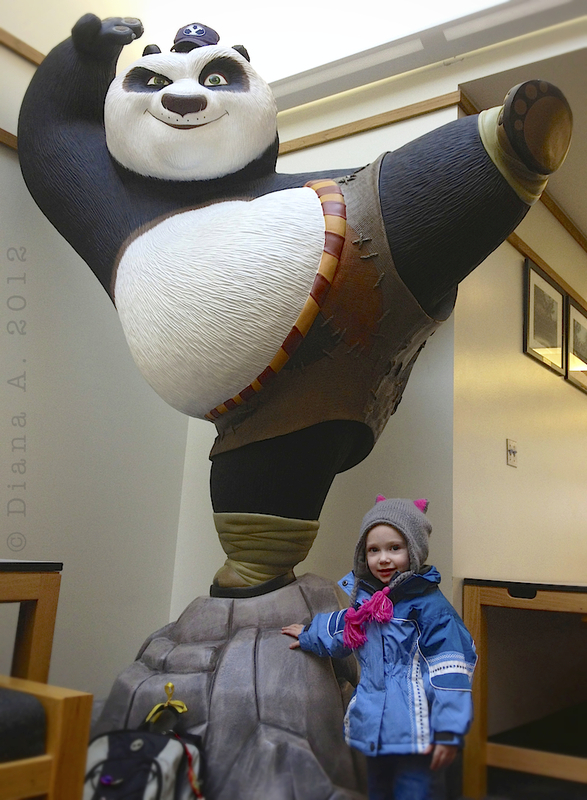 Here's Smalls back in 2012 with the "Kung Fu Panda" Po statue gifted from DreamWorks Animation to Brigham Young University.